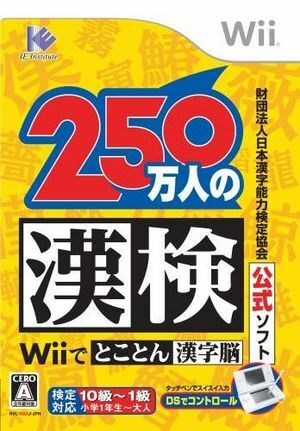 250 Mannin no Kanken: Wii de Tokoton Kanji Nou (loosely translates to 2,500,000 Kanji Questions: Complete Kanji Memory on Wii) is an educational video game released on the Wii by IE Institute. The goal of the game is to assist users in learning to write Kanji. Because of the complexity of multi-stroke Kanji, the game allows the option to use a Nintendo DS for drawing. The graph below charts the compatibility with 250 Mannin no Kanken: Wii de Tokoton Kanji Nou since Dolphin's 2.0 release, listing revisions only where a compatibility change occurred. This page was last edited on 8 January 2018, at 09:15.